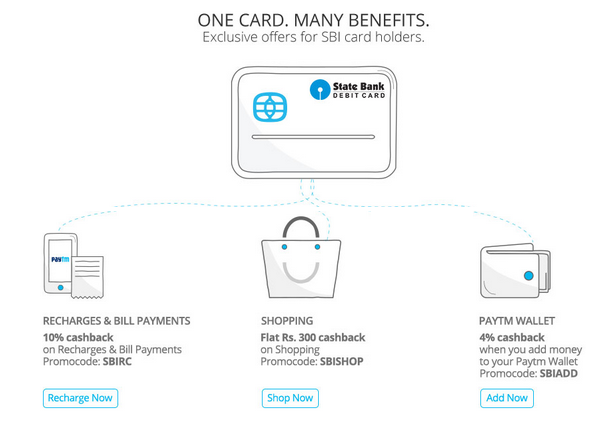 Paytm SBI Offer : Paytm this time comes with an another amazing offer. paytm offer Rs 300 cashback on Rs 600 worth shopping at paytm marketplace with SBI cards. This Paytm SBI offer is not Over Yet Paytm also Offers 10% discount on recharges with SBI cards and 4% cashback when you are adding money to your paytm wallet. Go to paytm app Android IOS WINDOWS. Add products in your cart which you want to buy. On next step apply promo SBISHOP. Complete your payment using SBI Debit/Credit Card. Your Paytm cashback will be added into your account within some time. Valid only on Paytm App. Not Valid on memory card, pendrives, gold and silver coins. Valid only once per user and card. Minimum transaction amount is Rs 600. Maximum Cashback can be availed through this Offer is Rs 300. Use promo SBIRC on next step. Complete your payment using SBI Credit/Debit Card. your cashback will be added to your account within some time. Maximum cashback is Rs 100 per transaction. Valid on two transaction per user and per card and per mobile number. Start adding minimum Rs 500 into your paytm wallet. Use promo SBIADD on next step. Maximum cashback is Rs 100. Minimum Transaction amount is Rs 500. Valid only once per user and per card. 4 Responses to "Paytm SBI Offer : Rs 300 Off on Rs 600 Paytm Shopping and more"